If you’re a fairly regular Bible reader, the book’s contents have guided and helped you, so the Bible can trigger memories in a similar way as postcards and photographs and music. The connection may be emotionally strong but purely personal, like the way Mendelssohn’s music always reminds me of Maryland and Schumann’s with Arizona. Sometimes your Bible memories are reflexive: passages spark memories of occasions of your own studying. Of course, texts like the nativity stories in Matthew and Luke and the resurrection stories in all four gospels evoke memories of Advent and Christmas, Lent and Easter, and our personal memories associated with those seasons. I also love good old 1 Corinthians 13, a vivid reminder for many contexts, but it was also read at Beth’s and my wedding. The stories of Noah’s ark (God’s salvation through water) and of Jesus blessing the children call to mind our daughter’s baptism, since these were part of the liturgy. So when you are offering your gift at the altar, if you remember that your brother or sister has something against you, leave your gift there before the altar and go; first be reconciled to your brother or sister, and then come and offer your gift (Matt. 5:23-24). Beware of practicing your piety before others in order to be seen by then; for then you will have no reward from your Father in heaven (Matt. 6:1). Grandma could be stubborn and hard to please but she had a kind heart and took the initiative to do good things and to correct difficulties between her and someone else. Also: she never told this to anyone, I heard about it secondhand, which made her witness all the more effective. (But if I remember correctly, Grandma never quoted a single verse of the Bible in my presence. Christ certainly worked through her, though.) Although she had limited means, she purchased for me a Bible dictionary that I still use frequently. Back then, I was merely polite; I was fourteen and wasn’t yet deeply interested. At the other side of the human spectrum, I find the parable of the vineyard (Matt. 20:1-16) and recall a relative on another branch of the family tree. I won’t name the relative, who led a less than exemplary life. 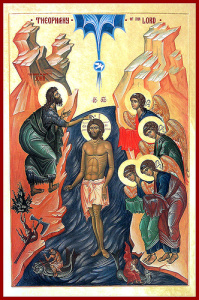 The person, when dying and fearful, called upon a local pastor and was baptized. Does a deathbed conversion count? Grace is unearned, and God’s opinion of a despised person may be completely different from our own. Those of us with good character and excellent reputation don’t deserve God’s grace any more than a person, like my relative, who repents in late desperation. [W]hy do you submit to regulations, “Do not handle, Do not taste, Do not touch”? All these regulations refer to things that perish with use; they are simply human commands and teachings. These have indeed the appearance of wisdom in promoting self-imposed piety, humility, and severe treatment of the body, but they are of no value in checking self-indulgence (2:20b-23). While I wouldn’t at all call baptism a “human command,” the author worries (in this and the whole section 2:8-23) that we need to hold to Christ alone and not upon any rituals and practices, important as some of them may be. Fulfilling religious requirements is never as important as opening our hearts to God for God’s powers (Gal. 5:16-26, 6:14-15). But my older relatives are long passed away. I’m not sure I could’ve argued doctrine with them anyway, for they were quite set in their views, and I’m not really a debater. I leaf through my Bible for other associations. I look through Song of Solomon and find 2:15a, a verse I once used to impress a long-ago love interest. I’m chagrined at the memory, but I think that’s the worst example of me using the Bible for my own purposes. You may associate particular Bible verses with your pastors. Hopefully these are good memories: pastors are as fallible and human as anyone. Among my good memories is a pastor who finally helped me make sense of Jesus’ famous “turn the other cheek” teaching. He connected it to the joy and inner peace we can have through God, so that we don’t have the need to retaliate, to angrily prove ourselves. Many of my earliest notes in my old Bible are brief notes I took when listening to sermons, and I still take notes during the Sunday message. If your pastors were conduits of God’s blessings to you, you keep these leaders in your heart because of their insights and also their compassion and care. A Lutheran pastor in my hometown was tremendously influential upon me; he had worked with the poor of New York City before serving Midwestern congregations including my small hometown. He died about the time I graduated from college, but he was one of the first to help me think about the social implications of the Gospel. Psalm 46 reminds me of him in a round about way, because “A Mighty Fortress Is Our God” reminds me of him, and that hymn is based on that psalm. Speaking of hymns, your favorites may be based on particular Bible passages. Check the source information at the bottom of the hymn’s page. A few examples are “Take My Life, and Let It Be” (Roman. 12:11), “Come, Though Fount of Every Blessing” (1 Sam. 7:12), “For All the Saints” (Heb. 12:1), “At the Name of Jesus” (Phil. 2:5-11)—and many others, including seasonal hymns. 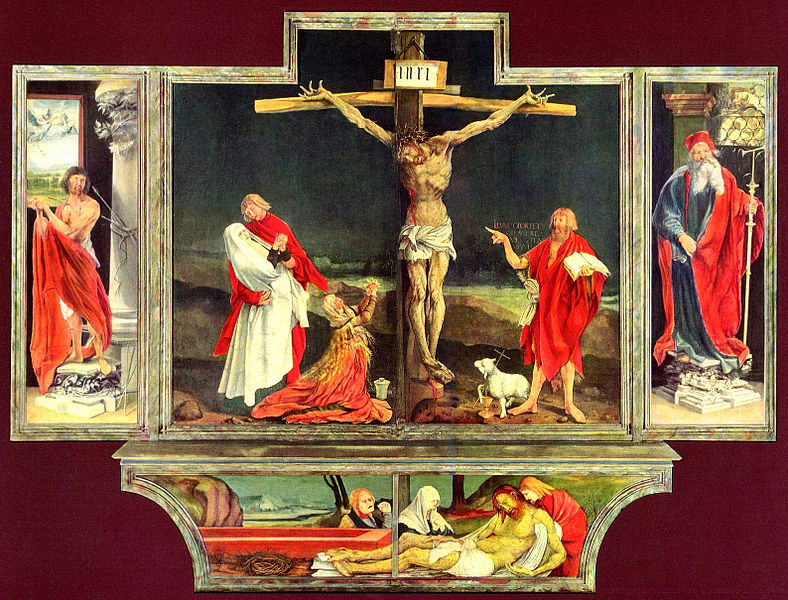 Isenheim Altarpiece, sculpted and painted by, respectively, Niclaus of Haguenau and Matthias Grünewald. From Wikipedia Commons. Bible passages also bring to mind any number of works of art, depending on what are your favorites: works by Michelangelo, da Vinci, Rembrandt, Caravaggio, Dürer, Raphael, Chagall, Rouault, and musical pieces by Bach, Handel, Mozart, Mendelssohn, Pärt, Britten, Durufle, Vaughan Williams, Bernstein—-I’m leaving out so many. That’s a whole separate topic, or a whole set of personal memories. I read of Jesus’ agony in the garden (Luke 22:39-46 and parallels) and think of the altarpiece at the restored Frauenkirche in Dresden; when I read the call of Matthew (Matt. 9:9-13 and parallels), I think of Caravaggio’s powerful rendering—and, again, there are many other examples. Bible verses can also remind you of groups of people, like congregations and study groups. Of course, Paul’s Eucharistic words in 1 Corinthians 11:23-26 are always part of Communion services; that passage can trigger memories of numerous churches for you. Ecclesiastes reminds me of a church that I served, because I was called upon (at short notice) to teach the senior pastor’s morning study group. We had a nice time. My previous Sunday school class tackled Esther, Proverbs, and several other books. I connect the Corinthian letters with this group, since we studied them straight through and realized, together, that we’d had enough of Paul’s writing style for the time being, all those tangents and heart-on-his-sleeve defenses. Those conflicts and disputes among you, where do they come from? Afflicted with Poe’s “imp of the perverse,” I said, without thinking, “Lasagna!” and everyone roared, including the couple. It was a “you had to be there” moment, but those moments shine in one’s memory. In fact, I associate James with two or three Bible study groups. The epistle lingers in memory because, among its several incisive teachings, James cautions us about the power of words (James 3:1-12). The teaching is quite clear in Scripture: the power of our words are barometers of the soul (Matt. 12:33-37), and Ephesians links truth and love, for our words are not true unless they are kind words that build people up (Eph. 4:15, 25-32). Many of us Christians, apparently, have lots of trouble with our big mouths! I recall occasions when my churches friends and I sighed in self-awareness as we read these verses from James and knew, If you, O Lord, should mark iniquities, Lord, who could stand? (Ps. 130:3). Bring the full tithe into the storehouse, so that there may be food in my house, and thus put me to the test, says the Lord of hosts; see if I will not open the windows of heaven for you and pour down for you an overflowing blessing (Mal. 3:10). For years, when I was little, I’d an image of the Israelites placing their checks in small envelopes for the collection plate. This verse reminds me now of my dad. He hadn’t attended church for many years, and we finally got him interested in attending. But the sermon that Sunday was on tithing, which, with his Depression-era attitudes toward money, made him angry and uncomfortable. I thought we’d lost our only chance. Fortunately the Holy Spirit was working in his life, and he attended church regularly, volunteered, and was baptized. Now there were devout Jews from every nation under heaven living in Jerusalem. And at this sound the crowd gathered and was bewildered, because each one heard them speaking in the native language of each. Amazed and astonished, they asked, “Are not all these who are speaking Galileans? And how is it that we hear, each of us, in our own native language? Parthians, Medes, Elamites, and residents of Mesopotamia, Judea and Cappadocia, Pontus and Asia, Phrygia and Pamphylia, Egypt and the parts of Libya belonging to Cyrene, and visitors from Rome, both Jews and proselytes, Cretans and Arabs—in our own languages we hear them speaking about God’s deeds of power.” All were amazed and perplexed, saying to one another, “What does this mean?” But others sneered and said, “They are filled with new wine” (Acts 2:5-13). Again the sentinel reported, “He reached them, but he is not coming back. It looks like the driving of Jehu son of Nimshi; for he drives like a maniac” (2 Kings 9:20).